(Willie, who has done a tremendous amount for SVHC, is well known to many Scottish Veteran Harriers Club members and still continues to battle round the annual Scottish Masters Cross Country Championship. While I was at Aberdeen University and he was near his peak, I remember racing him in the 1968 Tom Scott 10 miles – Willie beat me by over 20 seconds and received a treasured first class certificate. His longevity as a runner is amazing – at the end of September 2017 he will have been in Athletics for 70 years, 27 years with Monkland Harriers and 43 with Law & District AAC! Willie is 81 years young, having been born on the 26th November 1935. He joined Monkland Harriers in October 1947. He enjoyed football and swimming but took to running because he thought he could be good. He got involved in the sport because he saw an advert in a pub window to join Monkland Harriers. Competition began in 1951 when he was a Youth (under 17). This was the youngest age group at the time and very few events were available: only 100 yards handicap and the occasional 880 yards handicap. The minimum age to take part in road and cross country was 16. 880 yards – 2.02.3 (1967); 1 Mile – 4.29 (1967); 6 Miles – 30.09 (1967); 10 Miles Track – 51.50 (1967). Willie had a fine record in the Scottish 10 Miles Track Championship. He won a bronze medal in 1966 at Seedhill, Paisley, recorded his personal best a year later, and between 1966 and 1969 was high in the annual Scottish rankings: fourth followed by seventh three times. In the Scottish Senior National Cross Country he was a very respectable 29th at Hamilton Racecourse in 1966; and 39th in 1967, when ten New Zealand team members were allowed to take part as guests. In the Scottish Masters Cross Country, he was second M40 behind the great Bill Stoddart in 1978; second M70 in 2010; third M75 in 2011; and third M80 in 2016 and 2017. Willie was known as a good road runner. He took part in several Edinburgh to Glasgow Relays between 1965 and 1980. 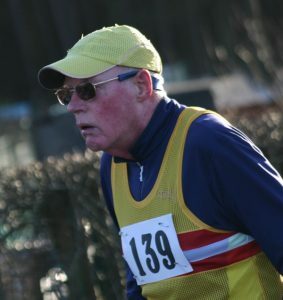 For Monkland Harriers he took on the most competitive stages (2 and 6); and was in their best teams when they were ninth in 1971 and tenth in 1972, when his team mates included future SVHC stalwart Bill McBrinn and young stars like Jim Brown, Ron MacDonald and Ian Gilmour, who went on to run for Britain. Between 1974 and 1980, Willie often ran Stage 8 in the E to G for Law and District. The club’s best position was tenth in 1974, when Willie’s fastest team mate was Scottish XC International XC John Myatt. In November 1966 Willie won the handicap in the traditional Brampton to Carlisle 10 miler; and on the 1st January 1967 was second in the handicap in the even more famous Morpeth to Newcastle (at least half marathon distance) in a time of 71.51, a personal best by over four minutes. He ran the top Scottish event, the Tom Scott 10 (over the old Law to Motherwell course) in under 51 minutes, finishing 14th. Willie is a hill walker and also liked hill races and his favourite was the long-established Carnethy event, which he ran twelve times. Willie Drysdale reckons that his fastest years were between 1967 to 1975, when he was 32 to 40 years old. Normally he trained once a day, 6 days a week, resting on Friday, since races used to be on Saturday. His weekly training distance, up to age fifty, was about 50 or 60 miles. He also used to do weights at Monklands. As a Veteran and Masters athlete, since March 1997 he has trained off road, due to back and knee problems. However he can still run for 60 to 80 minutes and goes to the gym three days a week. Occasionally he does speedwork – some strides in the football park! Willie used to train at Corkerhill Stadium (near Bellahouston Park) on Sundays between the early 1960s to mid 1975. The best thing that happened was that Ken, a Senior Lecturer at Jordanhill College, supervised Willie’s weight training between 1963 and 1965. After that, Willie started running personal bests. His original work training, as a pre-apprentice engineer, was at Coatbridge Technical College; and then he went on to qualify as a turner and fitter. National Service. Between 1957 and 1959 he served with the Royal Scots Greys. He had seven weeks of general and fourteen weeks specific training as a Centurion Tank driver, then stayed at Catterick in Yorkshire for one year. In 1958 the Greys were sent to Munster in West Germany, near the Dutch border. In October 1957 Willie ran a North Yorkshire & South Durham Cross Country League race and finished well up and first home for the Greys. He was asked to run for the league in an inter-league match – but his officer said to the selectors that Willie was not good enough! The officer was proved wrong in February 1958 when the Northern Command XC championships were held at Catterick and Willie ran well to finish third; then he was 28th at the Army XC championships at Aldershot but writes that this was a bad run for him. Between 1966 and 1979 Willie worked as a technician at Strathclyde University. In 1967, through S.U., he got treatment three times a week for a hamstring injury at Corunna Street physiotherapist. However the injury did not clear up properly until 1980. At lunchtimes he ran five to seven miles along Alexander Parade to the golf course and back. Between 1979 and 1989 he worked as a technician at Wishaw High School – and trained by running five and a half miles there from his home; and back later on. From 1989 to 1997 he worked as a technician at Carluke High School. Willie used the gym when at Carluke and, after retiring in 1997, continued to use the gym. As for diet, Willie writes that he just eats normally. The GP has given him Adcal-D3 vitamin. He also takes Perindopril (blood pressure) Simvastin. Willie was mostly self coached, although he was supervised at Corkerhill a little. He himself had a coaching qualification from the 1960s onwards. In addition he was Secretary and Treasurer at Monkland Harriers; and, when President, organised the club training. Since joining Law & District AAC, Willie has been Secretary three times and has been a Life Member since 2009. He helps the club at league matches and compiles the results for the referee. He assists with the organisation of the Tom Scott 10 miles road race at Strathclyde Park. Willie Drysdale was a member of The Scottish Marathon Club; and continues to belong to the Scottish Hill Runners and the Fell Runners Association. He was President of the Scottish Veteran Harriers Club from 1999 to 2001; and was Secretary from 2001 to 2012. He still works for the club in a number of ways. Willie writes that he has always liked to compete in races to find out if he can improve his performance. Nowadays he just wants to keep on running and intends to take part in the BMAF XC championships at Forres in 2018. Running, he writes, is a great way to meet people and to see other parts of the country. He has competed all over Scotland, in some parts of England, in Spain, Portugal, the USA and Canada. Willie Drysdale has enjoyed it all.